As HVAC systems work to control indoor climates for comfort and optimized productivity, the nature of HVAC operation promotes the contamination of indoor air. This is due to bio-growth that occurs on wet cooling coils and other interior surfaces and from the distribution of allergens and particulates to every room in the structure as air is circulated. Improve indoor air quality AND reduce HVAC energy and maintenance costs-at the same time! Energy use is reduced because the HVAC coils are continually cleaned of mold and other biological contamination with the 24-7 application of UV-C light. The gradual reduction of efficiency between conventional cleaning is eliminated. 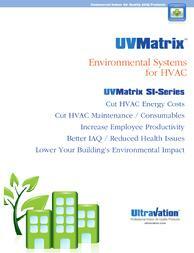 The energy saved can far exceeded energy used by the highly efficient UVMatrix system. 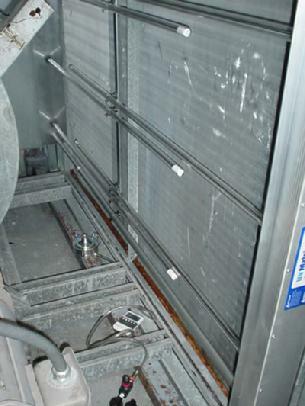 HVAC maintenance costs are reduced because UVMatrix SI continually cleans the coil reducing or eliminating the need for expensive and environmentally-detrimental chemical HVAC coil cleaning techniques. Ultravation's T3 design UV lights enable them to emit 40% more UV-C, with no additional energy cost. Using economical standard UV lamps, Ultravation achieves the disinfection power of power-hungry "high-output" lamps. T3's patented lamp system thermally optimizes each lamp-for more output than is otherwise possible without increased energy consumption. More output and longer life makes Ultravation T3TM UVC lamp system unsurpassed in efficiency. The thermally optimized, encased UVC lamp system does not mean you must replace the entire unit when lamps are changed. You only replace the low energy consumption standard UltraMAX UV lamps inside. And changes do not require highly trained personnel. Stainless steel components assure tolerance of wet environments. Water tight connections protect electronic components. HVAC interiors are naturally wet as air is dehumidified. This means the SI-Series designed to withstand wet conditions. 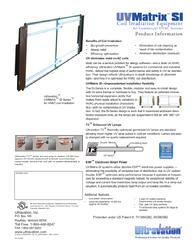 Patented* expanding system makes the SI-Series ideal for new or retrofit installations. The SI-Series is designed to install in virtually any air handler because of its expandability. We will size the system appropriately for number of lamps and the flexible equipment is ready to fit the unique characteristics of the air handler.